The Wingland fun fly event is an annual gathering of microlight/ultralight pilots, model aircraft displays and flying. Everyone is welcome though, young and old, flyers and non-flyers, families and aviation nuts. There will be flying and non-flying events and competitions, a bouncy castle for the little’uns, camping facilities, ‘show n tell’, merchandise, LIVE music, BBQ and the best thing of all is that’s it’s FREE!!! Free flying, free camping and free food. Just bring as much alcohol as you can handle. We want to make this event even BIGGER and better than ever!!! TechnoFly the company that brought us the Ventor 125 a light weight engine that incorporated a clutch, a geared re-drive and an electric starter all into a 13.3kg engine package. 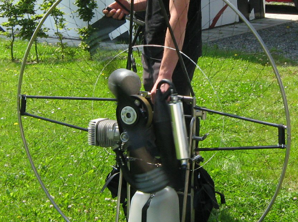 They have now gone on to produce an even lighter paramotor engine by eliminating the clutch, gearbox and starter motor to produce a pull start, belt driven engine that not only weighs less but cost less also, citing that one of the most expensive parts on an engine is the gearbox. The new engine dubbed the ROTOR H-130 claims to produce 65kg thrust yet is only 11.3kg complete with exhaust. TechnoFly state that the engine is designed with a horizontal cooling head for improve airflow.